Have you seen Elephant Dancing? 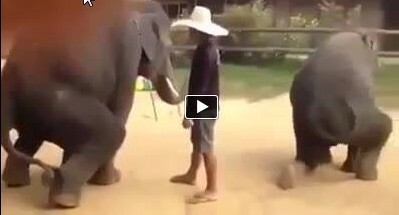 Watch this Video of Elephants dancing to the tune of Gangnam Style.Wow! even elephants can be trained to dance. @catarina This is not entertainment, they "dance" out of fear of being beaten. The trainers should not be applauded, this is not a skill, its humiliation. I wish peace for those elephants, and all others who are enslaved by egotistical, selfish and ignorant humans. @Mandy This is horrific, abusive, and has no place in civilized society. How sad that this can still be considered 'entertainment'in the 21st century. Shameful!!! !